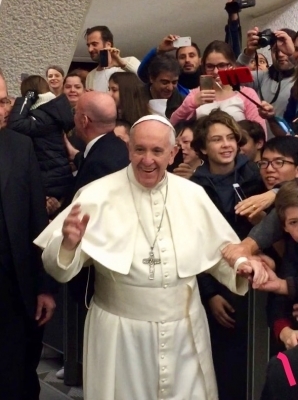 Every Wednesday morning, Pope Francis holds the Audience, which is open to the public with reservation. Please contact the Italian Concierge to reserve your space for this holy event. We are able to request tickets on behalf of your family, small group, or couple, but cannot guarantee space. During warmer months, the Audience is held outdoors in St. Peter’s square. During colder seasons, the ceremony is held indoors in the Paul VI Audience Hall. You may recognize the building as it is where the Vatican Christmas concert and other Papal events are held. The Audience with the Pope consists of small teachings and readings, given in Italian by his Holiness, and translated into several other languages by attending clergymen. The Pope’s teachings are translated into English, French, German, Spanish, Portuguese, Arabic, Russian, and others, depending on which groups are visiting. Towards the end of the session, the Pope will invite everyone to pray together, the Our Father prayer in Latin, which is printed on the back of each ticket. While the Audience is held regularly on Wednesdays, there are certain weeks in which the Pope is away from Rome. Please note that in August, the Vatican Offices are normally closed during the Italian Holiday period. In August, the Audience is sometimes held at the Pope’s summer residence of Castel Gandolfo (about 45 minutes outside Rome), or not at all. The Vatican does list the dates of the Audiences and other events on their website, with periodic updates, usually three months ahead of the scheduled dates. While there is no charge for these tickets, they must be reserved well in advance. We at the Italian Concierge are able to request tickets on your behalf, up to three months before the desired date. 1. You must pick up your tickets in person the Tuesday before (between 3-6pm) at the Bishop’s office near the Trevi Fountain. 2. Arrive early. The line starts to form at 7am or before, so the sooner you arrive the better. The doors open around 7:30am, and all seats are on a first come first serve basis. 3. Snag a seat close to the aisle. When held indoors, the Pope enters through the back of the auditorium and walks down the center isle. 5. Newly married couples are invited to receive a special blessing by the Pope. Contact the Italian Concierge for more details. For the devout Catholic, religious minded, or those want the chance to see the Pope up close and personal, this is an experience not to be missed. Whether you are traveling in a small group, couple, or family, contact the Italian Concierge to plan your next customized itinerary to Italy.